At 11 o’clock on 11 November, the Frankfurt International School (FIS) commemorated the centenary of Armistice Day. 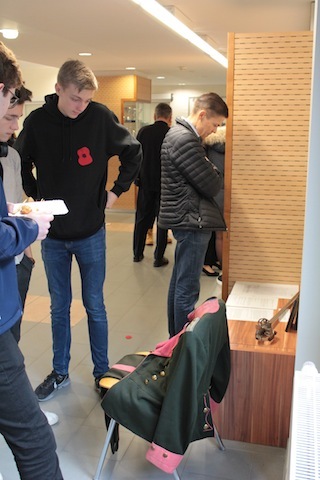 In addition to staging dance, drama, spoken poetry, orchestral and choral performances, FIS exhibited some artifacts that were contributed by members of the school community. 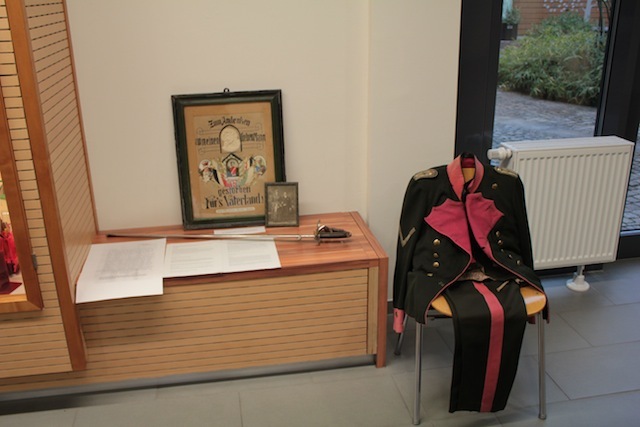 The uniform and cavalry sabre of Engelbert Seufert appears below, along with a wedding portrait with his wife, Veronika, and her memorial to his falling in battle on 9 June 1918. Engelbert Seufert was my paternal grandmother’s first husband. Students displayed the artifacts in the exhibition and answered questions about their historical context and significance. 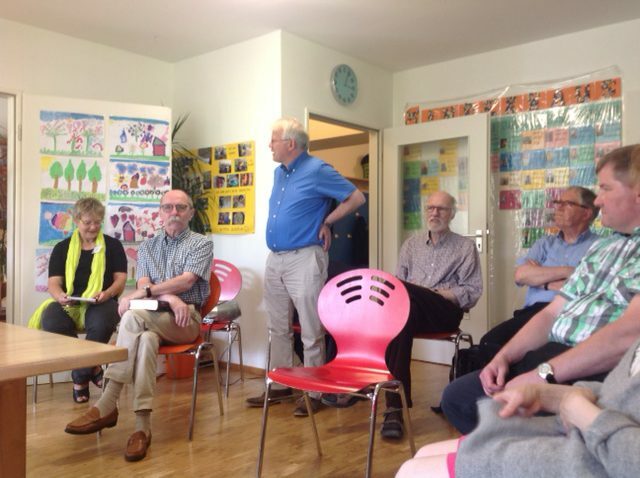 Yesterday afternoon, our work group Arbeitskreis Camp King was visited by a special guest speaker, Günther Vieser, to talk of the time, when he was working side by side with the former chancellor, Willy Brandt, from 1979 – 1982. At that time, Mr. Vieser was Brandt’s advisor, when he was Chairman of the Social Democrats. One of the topics in question was of how much former chancellor Brandt’s doings contributed to solving the East-West conflict versus Chancellor Kohl, who reigned at the time, when the wall came down. Another question was what it was like to work with him on a professional and personal level. Of course, the spy Guillaume from the East German State was also mentioned and it was questioned why he chose Oberursel as his first place of residence in the West. For several months, Guillaume had rented an apartment downtown Oberursel, at the Homm Kreisel. In 1974, Chancellor Brandt resigned over the espionage scandal. Mr. Vieser’s informative talk lasted close to two hours and we not only got a refresher course in modern history, but also heard some personal stories and tidbits. After the talk, one of the visitors approached me. She said she remembers one time Willy Brandt came on an official visit to Oberursel. 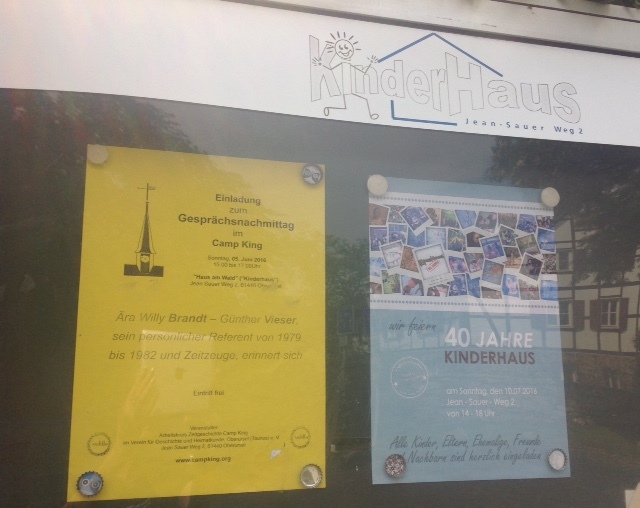 At that time, she was working for the Deutsche Rote Kreuz (DRK) (German Red Cross), and she confirmed how grown up women acted like teenagers as soon as Brandt showed up, with women screaming and occasionally fainting during his visit. 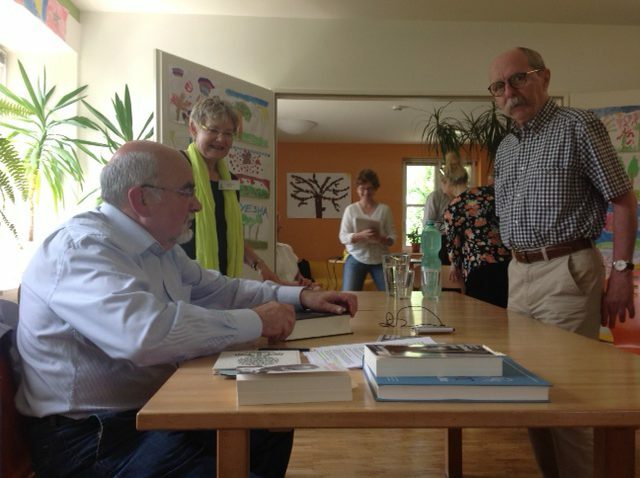 On his other visits to Oberursel, he would also meet with other young politicians of that time: Jürgen Habermas, Oskar Negt, and Joschka Fischer. 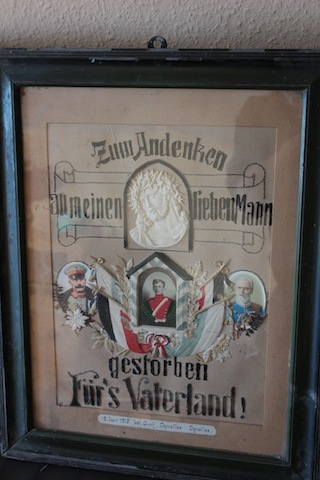 They would stay at the former Villa Gans, which the state of Hessen had turned over to the Deutsche Gewerkschaftsbund (DGB) in commemoration after WWII – as a place for Völkerverständigung und des Aufbaus der Demokratie (international relations and founding democracy). I like the idea, that the beginning of democracy in modern Germany started with parties on a garden patio. That same place is now the Dorint Hotel Frankfurt/Oberursel (140 rooms, including 15 suites). Mayor Brum also had a few welcoming words for the guest speaker. 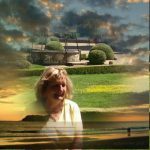 Special thanks to Sylvia Struck, who is in charge of our ‘Work Group Camp King’, for putting together this event.